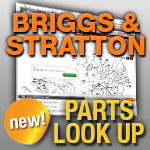 Replacement Briggs and Stratton starter parts are here. Briggs and Stratton is one of the most trusted names in small engines. Since 1997, Jack's has been one of the most trusted names in online small engine part sales. Let us provide you with the parts you need to get your engine running again. Choose a category below to search for Briggs and Stratton starter parts. We also offer Briggs and Stratton Engine Parts and Briggs and Stratton Starters.